3/4 size guitars are for young students between 8 and 11 years. They are also called 36 inch guitars. This guitar size and 1/2 size guitars are the most sold student guitars for kids and youth. Most kids and youth start learning guitar between 6 and 10 years at school or with a private guitar teacher. That’s exactly why there is a huge choice for this guitar size on the market. 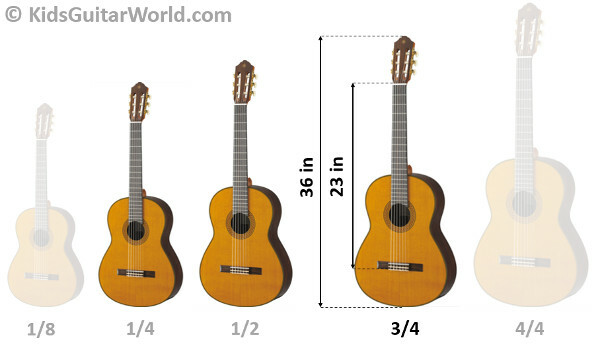 Besides, the guitar size doesn’t refer to the total guitar length but to the scale. The scale is the distance between the bridge and the guitar head that measures about 3/4 of a full size guitar. As 3/4 size guitars are one of the most sold guitars on the market there are also some good electrical ones out there. A classical nylon string guitar is however always preferable for kids and young beginners that just starting playing guitar. However, for older kids and youth who are already playing guitar, the circumstances are quite different. They have already developed some hand and finger strength and may be ready for the switch to a steel string guitar. A steel string acoustic guitar or an electric guitar might be reasonable choice in this case. A lot of young students and beginners start with a Yamaha guitar. Guitar teachers often recommend this guitar brand for the good price quality ratio. I also love Yamaha guitars because all models I have played were just so comfortable to play and had a really good sound. The Yamaha CGS103A is a 3/4 size youth guitar and it’s really worth the money. It’s a nylon string guitar with a spruce top which ensures a good sound quality. For the neck Yamaha has chosen Nato which I find quite comfortable to play. All in all, it has got a very good finish and a nice sound for a reasonable price. It’s a high recommendation for all parents looking for an affordable guitar under $150. Another high quality guitar for beginner is the Cordoba Protege C1 that features as well a spruce top. It’s a beautful looking guitar with a quite thin vernish which ensures a good sound quality. Cordoba is one of the leading manufacturer for classical guitars and you can find nearly in all guitar shops their models. They sell most of its guitars with a gig bag as this one which is definitely a must-to-have when getting a guitar. In addition to that, there is also a guitar included in the package. Same conclusion as for the Yamaha guitar: You can’t do anything wrong with it and the guitar is definitely worth the money. A quite unknown guitar brand in the US is Ortega. The german guitar manufacturer has got a family guitar series and covers in this way all guitar sizes. These guitars are quite high quality and can be compared with instruments from Yamaha or Cordoba. Maybe their guitars have even a bit better quality in terms of finish. The Ortega R121 has got a solid spruce top and sounds really good for this size. Some people use this guitar also as traveling guitar. The advantage of Ortega is that they also sell 3/4 guitars in different colors which is always an interesting point for kids. The Ortega R121 is available in nature, white and wine red. To be complete we should also mention the Hohner HC03. Hohner is a quite famous and poupular brand for beginner student guitars. It has got a spruce top and quite comfortable neck profile. All in all, a good beginner guitar for young students. However, I would rather prefer an instrument from Yamaha, Cordoba or Ortega. If you are looking for an entry level acoustic steel guitar for kids, then the Stagg SW201 might be of your interest. It is a good looking guitar with a nice sound and a good investment when getting started. 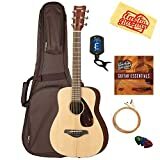 Stagg is a well known guitar brand for beginner acoustic guitars and concerning this model Stagg took into consideration some facts that are often forgotten by other manufacturers when it comes to kid’s guitars: variety of colors and left handed versions. So this model is , beside the standard natural design, also available in black for boys and in pink for girls. If your child is left handed, then this acoustic guitar from Stagg is one of the very few option you have. Yamaha has got also a great 3/4 size steel string guitar for kids: the Yamaha FG JR 1 which is a really great guitar. I already had the opportunity to play on it and it was a lot of fun even of your are not a child. It lays just very comfortable in your hands and the sound has got his own little magic. In my opinion this is the best 3/4 steel string guitar for kids. The value for money is incredible good and your child will definitely use it later on as a travel guitar. It comes in a package with a gigbag and a tuner, which are really important when starting playing the guitar. Read my review on this Yamha 3/4 guitar for more details. Another famous guitar brand is Ibanez and they have also a 3/4 kid’s guitar available. Ibanez doesn’t produce only entry-level guitars but also instruments for advanced players. They are also known for their good electric guitars. The Ibanez PF2MH 3/4 is a beautiful looking guitar with its darker natural wood appereance. The body, top and side are all mahagony. 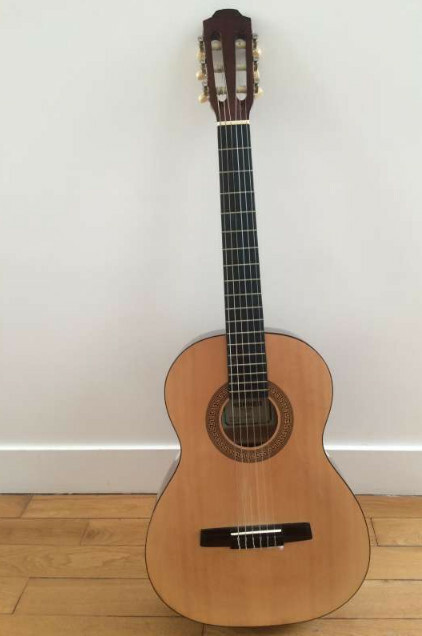 This guitar is also often a choice for people looking for a smaller guitar for traveling. Maybe your child is already playing guitar for a few years? Then you may consider also higher quality guitars. In my opinion, parents shouldn’t spend too much money on guitars for kids since they outgrow the instrument anyway. However, from 3/4 size guitars it’s different. A child will outgrow a 3/4 guitar as well but it can remain a perfect travel guitar. Many adults are buying 3/4 guitars as travel guitars since the sound difference between them and full size guitars are not that huge. In addition to sound issues, they have got just a great size to take them easily everywhere you want. Two of the best guitar brands in the world are Taylor and Martin. They are like pioneers in the guitar area and a lot of professional musicians pick up a guitar from on of these brands. They do no have really a focus on kid’s guitars but they sell anyway 3/4 guitar since these are also considered as perfect travel guitars. 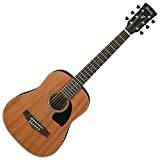 So the guitars to consider when looking for high quality 3/4 size guitar are the Baby Taylor and Martin’s LX1 Little Martin. The Squier Mini Strat is one of the best kid’s electric guitar I know. 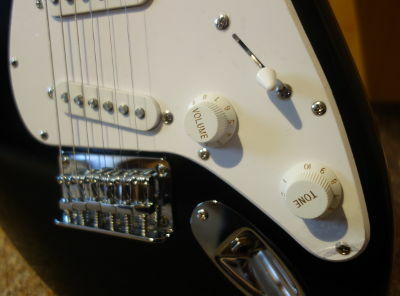 I already reviewed the Squier Mini Strat in a separate article. The instrument is available in black, sunburst, red and pink for girls. In general small quality electric guitar for a small price. when buying an electric guitar for kids, don’t forget that they come without amplifier and cable. So you might get them as well or you purchase a package.